By Kaylene Johnson-Sullivan. Ember Press, 2017. 112 pages. $19.99. Who knew that the part of Southcentral Alaska running from Seward through the Kenai Mountains to Cooper Landing and north along Turnagain Arm to the communities of Bird and Indian bears the special designation of a National Heritage Area? Established in 2009 by an act of Congress, it is one of 49 Heritage Areas in the nation and exists "to recognize, preserve, and interpret the historic resources and cultural landscapes of the Kenai Mountains-Turnagain Arm (KMTA) transportation corridor." "Trails Across Time" is a lovely, large-format book, an updated version of one first published in 2005. 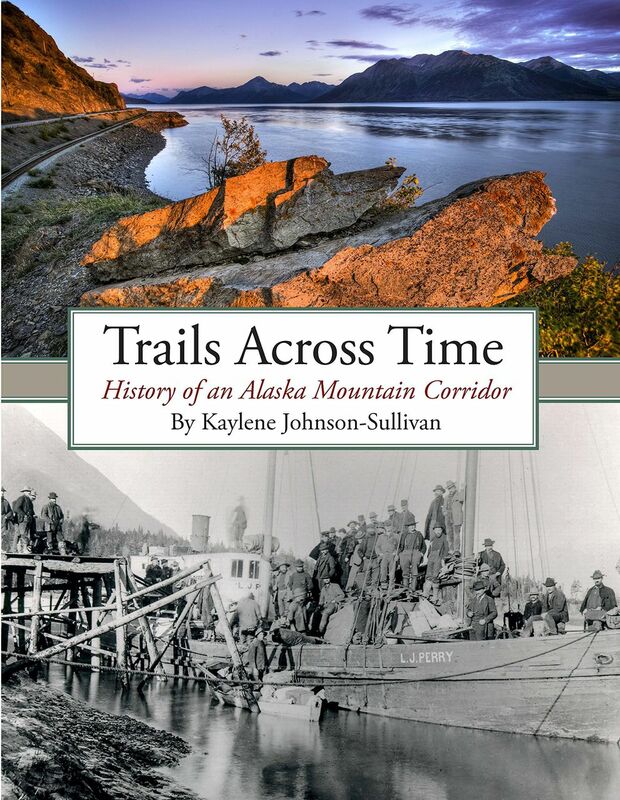 It includes helpful maps, historical photos and color photos by author Kaylene Johnson-Sullivan to tell the history of the region in eight chapters, emphasizing its development over time with particular attention to transportation routes. Portraits of individuals — famous and less well-known — exemplify the frontier spirit behind the large and small events that shaped the region as we know it today. It is the combination of broad-stroke information and intimate stories that makes this a book for newcomers and old-time Alaskans alike. It says here you are in a land where history is within living memory (and still being made). Get to know this place as you travel through it, and then learn some very specific, fascinating details about why things are as they are and who or what made them that way. Johnson-Sullivan, who also serves as the executive director of the KMTA National Heritage Area, begins with the geological forces — glaciers and earthquakes — that shaped the area. Travelers are likely familiar with the remains of buildings and trees at Portage, which sank up to 9 feet in the 1964 earthquake. With "Trails Across Time" as a guide, they can learn about geologic evidence of four earlier earthquakes that each similarly dropped the coastline in the same area. They can, moreover, locate an older "ghost forest" partially buried in the banks of Turnagain Arm. The author next gives significant attention to the earliest people, who traveled along the coast, on rivers, trails and across passes for food-gathering and trade. Later chapters present the search for the Northwest Passage (leading to Captain Cook turning around in Turnagain Arm), Russian America exploration and settlement, gold strikes, the Alaska Railroad, highways and the tunnel to Whittier and portraits of the various communities, including the abandoned gold rush town of Sunrise. Readers will learn why Moose Pass is called Moose Pass and Whittier, Whittier. Most chapters end with sections identifying particular landmarks with milepost directions. For example, in the railroad chapter, readers can learn not just about Seward's beginnings as a dream to build a railroad (and the two failures to do so before the effort was taken over by the federal government in 1915) but can locate historic stops like Lawing, Grandview and Kern and the engineering marvel known as The Loop. In the gold rush chapter, readers can find directions to mining trails, camps, and the cemetery at Sunrise; some of these off-road places would make good hiking destinations. "History is not just a chronology of dates," Johnson-Sullivan tells us. For one thing, it builds upon itself. The woodland trails of the first people became dog sled trails for freight hauling, then rough wagon roads eventually straightened into train track and highways. The original Iditarod Trail began in Seward and was not a single trail, but a 2,300-mile network connecting the port to the Iditarod Mining District and, finally, to the gold fields in Nome. After the gold rush, the war years (both world wars) encouraged more transportation connectivity. Laying train track and then road along Turnagain Arm were particular challenges, requiring a tremendous amount of blasting and excavating of mountain cliffs — work that continues to this day. The town of Whittier was originally built during World War II as an alternative (to Seward) ice-free port thought to be necessary for the war effort; what was first a railroad tunnel is now the longest highway tunnel in North America. Our road system altogether is startlingly young; the Seward Highway only opened to through-traffic in 1951. More than routes and places and dates, though, history belongs to individual people, and this book shines in telling some of those stories. Capt. Gerhardus Brandt is a mysterious figure who sailed to Alaska in the 1890s in search of gold and was buried in an elaborate gravesite on a knoll overlooking Turnagain Arm. Andy Simons, a big-game hunting guide with a conservation ethic, eventually became the Alaska game commissioner. Johnson-Sullivan has pulled together a gold poke of fascinating research for this volume, with hopes, she says, that it will be the basis for further historical understanding and interpretation. Her source list at the end offers a great starting point for those who want to delve more deeply into any of the subjects she's introduced.